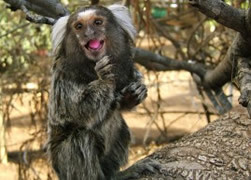 Would you like to volunteer with rescued primates in Pretoria, South Africa? International Primate Rescue is a very special charity in South Africa. 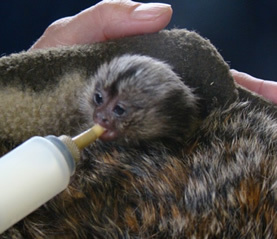 It was born as the Marmoset Welfare Foundation in 1996. Founder Sue Mousley had been caring for primates since 1990 and, intrigued by the behaviour of one particular marmoset, she began to study their behaviour problems and other disorders in captive and/or nonhuman primates. The sanctuary is located in Pretoria, 45 minutes' drive from Johannesburg. Eight month old Cheeky was the first Marmoset to arrive, and it wasn't long before the Sanctuary was receiving a steady flow of primates. This influx was aided by national press coverage, and it soon became necessary for the sanctuary to move to larger premises. Many arrive with behavioural problems and need rehabilitation. They would not survive if they went back to the wild, so they are kept in captivity at the sanctuary, with as high a quality of life as possible. They socialise with their own species (introductions are very carefully and slowly made). A natural habitat as close as they would have in the wild is provided for them. Their carers treat them with respect & compassion, and as individuals. 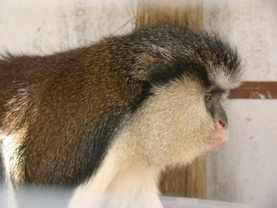 Papi (pictured right) is just one primate in the care of International Primate Rescue. Born in the West Indies, his parents were killed when he was young. Papi was destined for the exotic pet trade. He was sold as a pet in Hungary, then later passed to Hungary Zoo when his owner realised he was not suitable as a pet. Papi is understandably traumatised by his parents' death. Unable to socialise with the other monkeys at Hungary Zoo, the International Primate Rescue took him in. Papi is now much happier in a quiet environment, with love and attention. He has diabetes so needs extra special care. IPR is now looking to extend its premises, and groups in the Netherlands and South Africa are heping with fundraising. But people from all over are coming to help volunteer with the care of these primates - and this is where you come in. Enrichment - making sure the primates have something to keep them occupied! And, depending on your experience, there may be other things to do as well! Accommodation is available, costing you about £175 a week for bed & 3 meals a day. So you can go for a week away from it all to help out, or stay for longer - it's up to you! You should note that there is no internet access at the sanctuary.